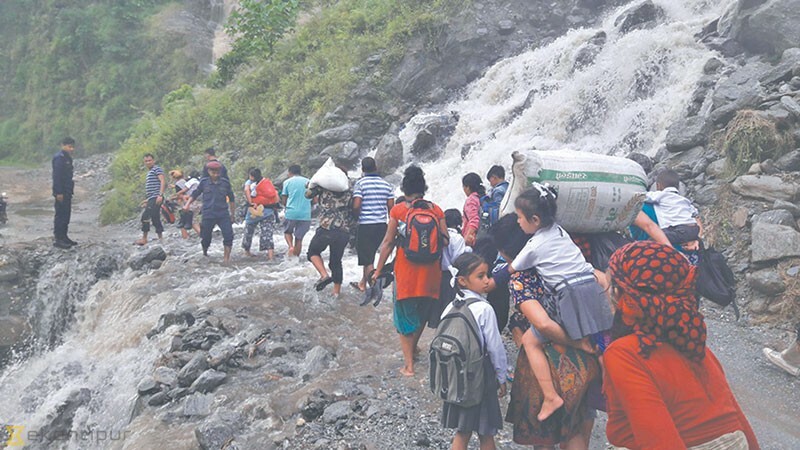 Multiple landslides in Tatopani area of Sindhupalchok district have become a cause for concern for local parents and teachers as children have to pass through landslide-hit sites to reach their schools. Landslides have damaged several sections of the Araniko Highway, particularly at Kodari and Tatopani. Local residents say travelling through the highway during rainy season is fraught with dangers. Whenever landslides block the highway, the people of Kodari and Tatopani walk to get around. Children either miss their daily classes or walk for hours to reach their schools if the highway traffic is obstructed due to landslides. Sanumaya Tamang, a fourth grader at Kodari Secondary School, seldom goes to school if the highway is closed. “It takes me about four hours to reach the school. On the way I have to cross four streams,” she said. Sanumaya lives with her parents in the village of Rangbusa. Twenty-five children from her village attend Kodari Secondary School. They are all affected whenever there is a major landslide blocking their way to school. Fifth grader Sabina Gurung said they walked to school in groups. Passing through landslide-affected sites could be difficult if there are no one to hold one’s hands or help them pass the many hurdles created by landslide debris. “The roads are usually full of mud, loose dirts and boulders. You cannot get across alone,” said Sabina. Nainedra Tamang, the school headmaster, said the school had high absence rate during rainy season. “Many students do not come to school because the roads are not safe for travel. Moreover, the school itself is situated at a landslide-risk zone,” he added. Most schools in Tatopani area are located close to the landslide-prone highway.